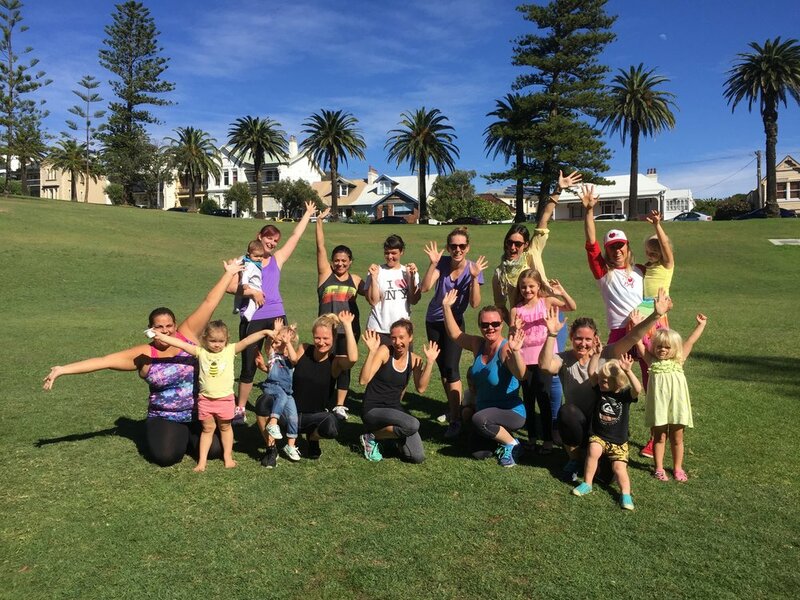 Pineapple Mums classes are fun, social and definitely not daunting. It’s a Group Personal Training session, not a boot camp. We have a high ratio of trainers to Mums to give you a personal training experience with lots of attention and support for less than the cost of a PT session. We program a lot of variety into our sessions, so even if you come every day, you’ll never do the same session twice. Plus we customise our sessions for different fitness levels, or for conditions like pelvic floor dysfunction or abdominal separation. We train rain, hail or shine! However, we do have an indoor option! We will always text you with an hour notice with the details if we change the class location. That's the beauty of our booking system! Our wet weather option is studio at G1, 56 Forbes St Carrington! Is my bub part of the workout? Nope, you lift your bub enough. It’s time for some time to yourself, so leave bub with our babysitters and enjoy the sun, fresh air and company! Where is my bub looked after? Do I need to be fit? Is it suitable for all fitness levels? We design our sessions for Mums of all fitness levels – whether that’s providing a safe and effective return to exercise after bub is born, helping you make a return to exercise if you haven’t trained in a long time, or giving you a challenging session if you already have a high level of fitness. I’m pretty fit, will I still be challenged? Definitely! If it has been a while since your last birth and you’re back to your fighting fit self, we’ll program more challenging options for you. I’ve just had a baby. When can I start? You can start after 6 weeks, as long as your Dr has given you a medical clearance to do so. To get started, you’ll need to give the trainer at your first class a letter from your Doctor giving clearance and any additional information regarding special considerations for exercise. I have a weak pelvic floor and/or abdominal separation – is that an issue? These are super common for new Mums (and people in general, men included), and we can help you rehab pelvic floor dysfunction or abdominal separation. Just let us know in advance, our workouts are customised so it’s comfortable and safe for you. Is it a big boot camp? Nope, these are Group Personal Training sessions, not boot camps. We keep our numbers small, or provide extra trainers to ensure you get a personal training experience with personal support, guidance and motivation, within a fun, social environment. How many baby sitters are there? It depends on the number of Mums booked in, but at least two. Is there a limit to how many children I can bring? Nope, the more the merrier. Extra help for new mums! If you've given birth in the last few years, we highly recommend conditioning your pelvic floor and core muscles whenever you have a little free time at home, or during class. It will make a huge difference and get you back to regular training sooner. Plus, if you ever need an alternate exercise during class, you can always pull one of the exercises out! We also have a private Facebook group just for our Pineapple Mums (and their Coconut Kids!) - make sure you add get Shell to add you to the group! C-Section - What's Safe To Do?